Roman Road is a Christian Church which began in 1901. For many years we were known locally as 'The Mission'. We are members of the Independent Methodist Connexion and are also affiliated with the Baptist Union of Great Britain. This took place at the 2011 annual assembly of the Baptist Union of Great Britain when, along with a number of other I.M. churches we were accepted as members. This final recognition followed some 5 years of sharing in Baptist life when we were graciously allowed to take up responsible roles in both the North West Baptist Association of churches and BUGB, and enjoyed the opportunity to network with the more local Baptist Fellowships. 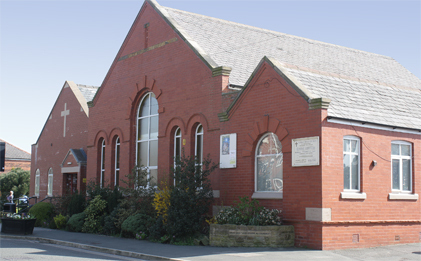 Baptist membership offers availability to resources as well as giving opportunity for mutual support and fellowship in this area of Greater Manchester, at a time when due to closure of many I.M. churches in the area there is little fellowship sharing available. These advantages apart, we believe that breaking the barriers created by denominational distinctive is a step towards the unity of the Church universal. THE TRINITY - We believe in One Living and True God, Creator of all, eternal in three persons as Father, Son and Holy Spirit; Him alone we worship and adore. GOD THE FATHER - We believe that God the Father Almighty, in holy love, gave his Son for the salvation of mankind. GOD THE SON - We believe that the Lord Jesus Christ is God the Son. For our sake he became man, was truly human and truly divine, and lived a sinless human life. We believe that He reveals the Father, that He died to atone for our sins, rose from the dead, ascended to heaven and was exalted. He is our Advocate, Mediator and Lord. We believe that He will return personally in power and glory. GOD THE HOLY SPIRIT - We believe that God the Holy Spirit convinces of sin, righteousness and judgement. He causes those who repent to be born anew and dwells within them, witnessing to their salvation and developing the fruit of a Godly life. He endows believers with gifts for the up building of the Church. He glorifies Jesus. MANKIND - We believe that all people are sinful and are unable to deliver themselves from the guilt, penalty and power of their sin. SALVATION - We believe that salvation from the guilt, penalty and power of sin to eternal life is a free gift of God. Salvation is His purpose for all mankind and is only possible through personal faith in the atoning work of the Lord Jesus Christ. We believe that all must stand before the final judgement of Christ and that those who have refused His salvation will be separated eternally from God. THE BIBLE - We believe that the Scriptures of the Old and New Testaments are the inspired Word of God and are the supreme authority in all matters of faith and conduct. THE CHURCH - We believe that the Church is the whole company of the redeemed in heaven and on earth and consists of all who are united to God through faith in Christ. We believe that Jesus Christ is the head of the Church, which is His body. The purpose of the Church is to worship God, to promote the fellowship of his people, to preach the Gospel and to make disciples of all nations. THE SACRAMENTS - We believe that the sacraments of baptism and the Lord’s supper are to be practised in obedience to the command of the Lord Jesus Christ. We believe that in the observance of the Lord’s supper, Christ is certainly and really present, though not bodily in the elements. When used by believers with faith and prayer, the sacraments are, through the operation of the Holy Spirit, outward and visible signs of inward and spiritual grace. THE CHRISTIAN LIFE - We believe in the priesthood of all believers, affirming that each believer has direct access to God through the Lord Jesus Christ. The individual believer is required to render obedience to Christ in every area of life, seeking always, under His direction, the advancement of His Kingdom. CHURCHES - Each Church is self-governing. Subject to the Church's trust deed, the members meeting is the final authority in all matters affecting the Church. CIRCUITS - Groups of Churches are associated in Circuits for mutual benefit. The meetings of the Circuits are deliberative in character and recommendations can only be effective by the co-operation of each Church. The organization of each Circuit is outlined in its rules. CONNEXION - All member Churches constitute the Connexion of Independent Methodist Churches. The organization of the Connexion is outlined in its constitution. Every believer is called to service in the Kingdom of God, there being no distinction between one believer and another beyond that of function. It is recognised that differing talents, spiritual gifts and ministries are bestowed on believers for the benefit of the church as a whole. Each church should, therefore, recognise and cultivate the talents, gifts and ministries of its members so that it may function as a ministering fellowship. To assist in church leadership, pastoral responsibility and the ministry of the Word and sacraments, the Connexion commissions to its ministry those who have been called to ministerial appointment in one or more of the Connexion’s churches and who have met the qualifications laid down in the current statement on Ministry. To assist in the wider ministry of the Word, the Connexion commissions and accredits preachers who have been nominated by their church and Circuit and who have met the appropriate qualifications laid down in the current Statement on Ministry. The Connexion may, from time to time, provide training and accredit people to other specified ministries in the Connexion, such as Bible teachers, evangelists, missioners, missionaries and youth workers. The Connexion makes no provision for the financial support of any personnel other than its central staff, evangelists and overseas missionaries. MISSION - The Connexion is concerned with the spread of the Gospel at home and overseas. Where required, Churches and Missions are assisted and new Churches or Missions may be formed, using Connexional resources of finance and personnel.